Hard to believe that for the first 25 days of the year I was able to keep up on a blog post a day...I guess, I've just kind of taken a short break :) but to get back to 'normal', here is this weeks Work In Progress Wednesday... with Lee from Freshly Pieced...post. New Bible Case. This is just one-half of the Carpenter Wheel block that I'm using as the main section of my Bible Case. The HST are sewn together, but they still need to be sewn into rows. I also need to make the HST for the other half of the block. At first, I was going to just use it like this...as half a block - but I'm really, really liking the color flow and combination...so I'm going to make a whole block and go from there. I love this block...probably why I like the Swoon block so well too! 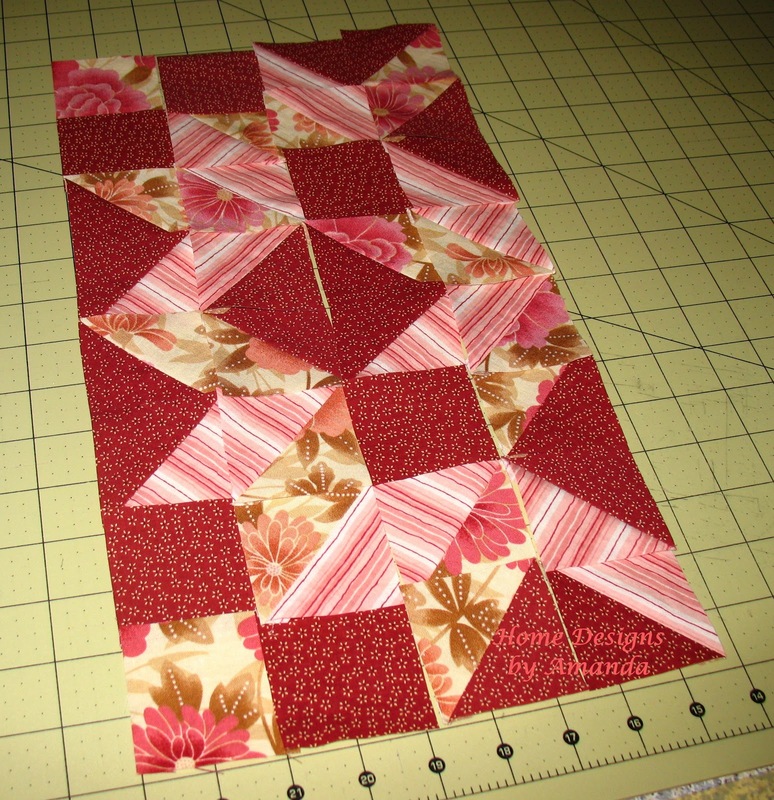 However, I'm not sure on the best way to quilt this block, any suggestions? By Friday, I'd like to be finishing up the Bible case and starting work on the favors for our church's Valentine's banquet...making cute little 'pockets' I saw on Carlee's blog, Ladybird Ln. Using pink, brown, and tan materials (alot like the colors in the Bible case) to make them Valentine's like, but not SO Valentine's that they are only usable once a year. Also, I was able to get the skirts finished...showed them on last Thursday's post.